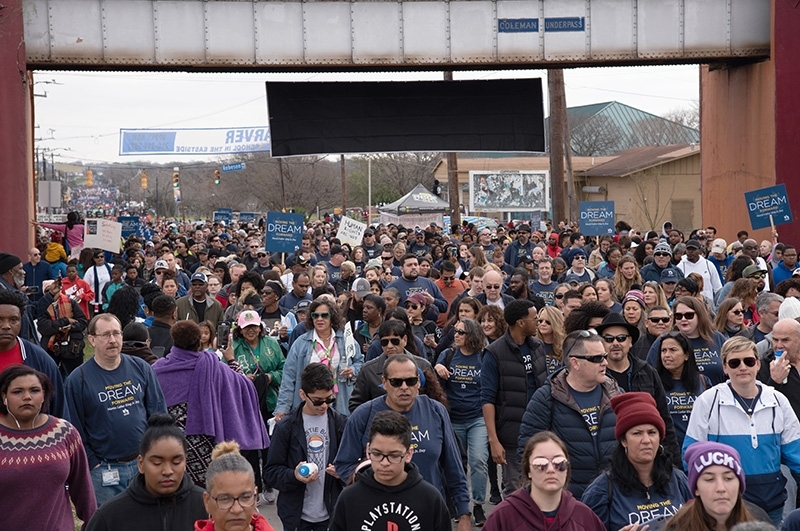 On the shuttle from Freeman Coliseum to MLK Academy, the starting place of the Martin Luther King Jr. March, I remember thinking how the civil rights movement started, partially, on busses. 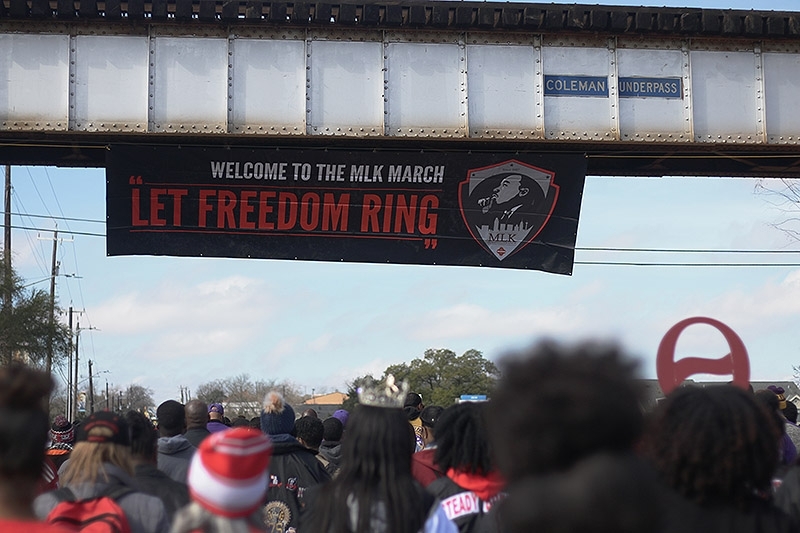 And when the shuttle dropped us off just before MLK Freedom Bridge on Monday, I thought of Selma, Alabama. 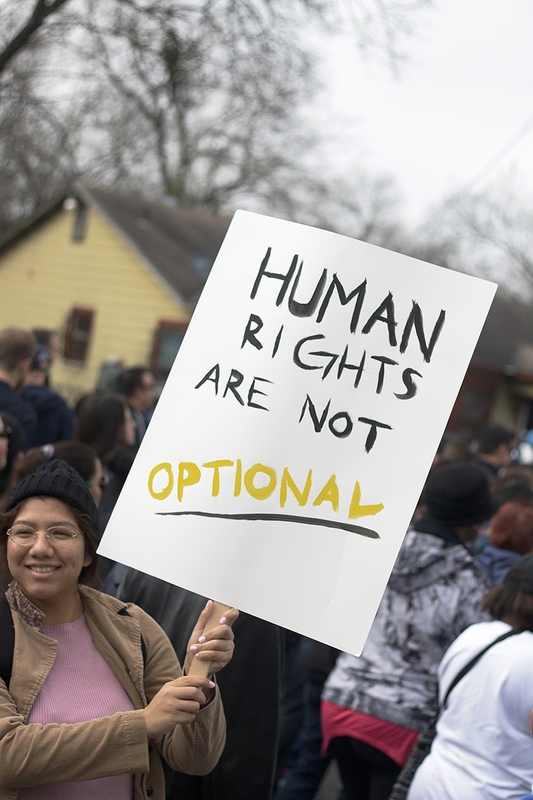 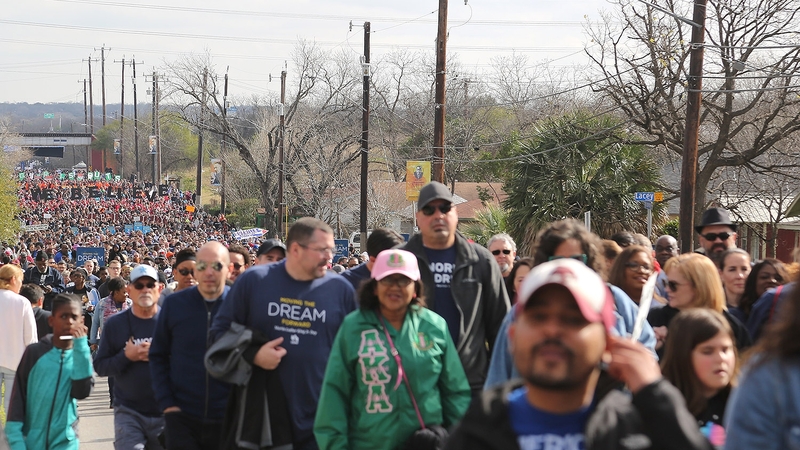 Unintentionally, the city of San Antonio has made a metaphorical journey through the civil rights movement before ending with a march in honor of it. 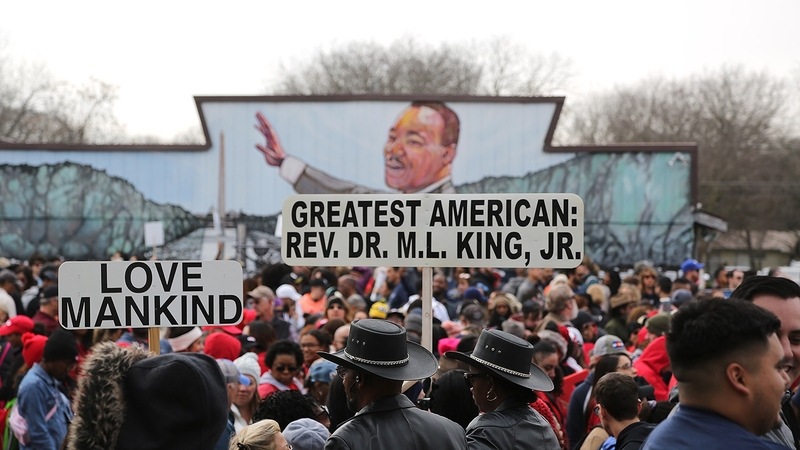 We walked across the bridge until reaching MLK Academy on the far East Side: people sang, took selfies, locked arms, played music through speakers and unrolled banners with quotes from King. 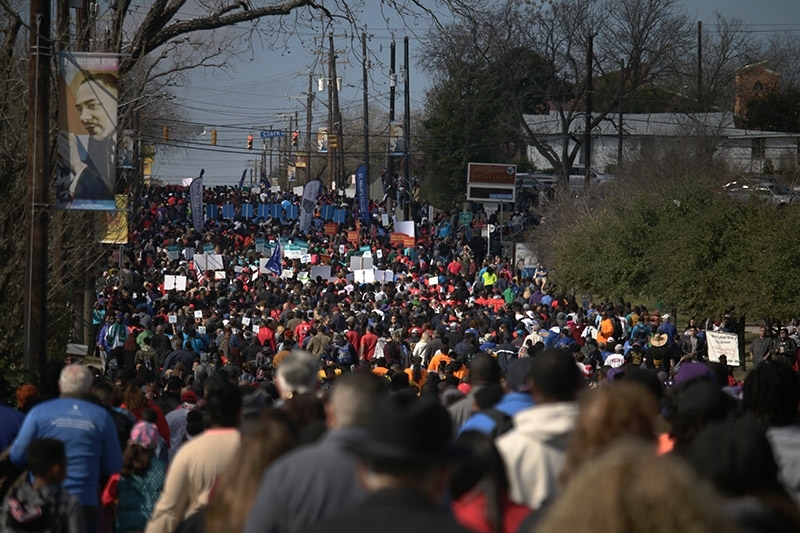 The crowd grew from a few hundred to a few thousand a few minutes after I arrived at MLK Academy: the influx was from a train that delayed hundreds of cars and a few of the shuttle buses. 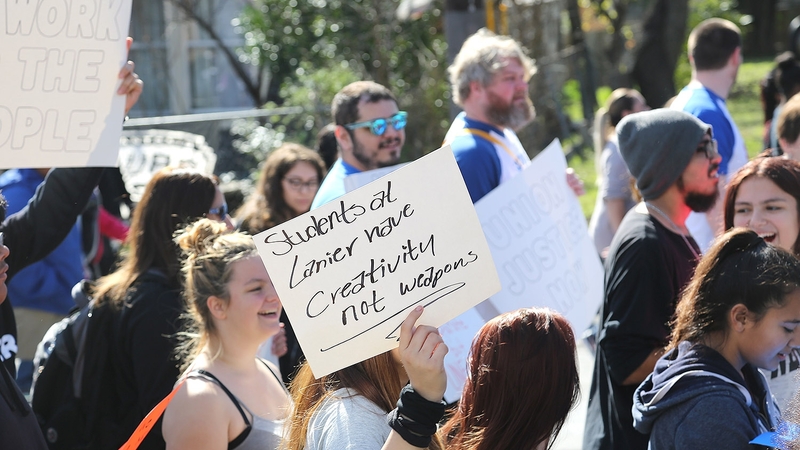 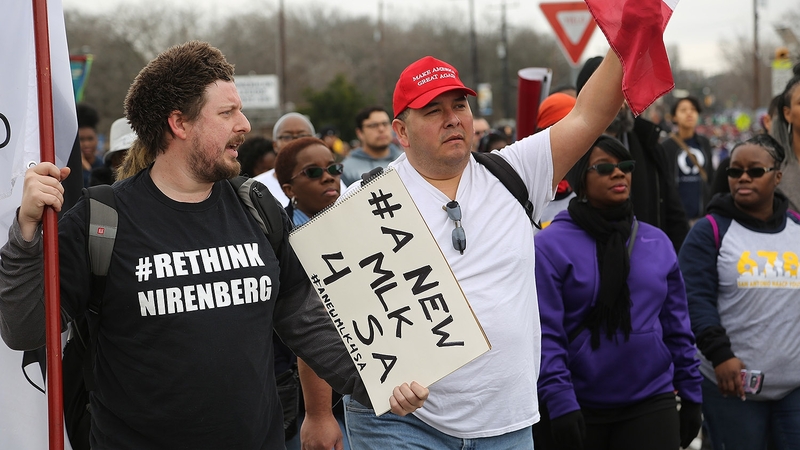 There were several groups representing historically black colleges and universities, MOVE Texas, True Vision Church, Democratic Socialists of America, etc. 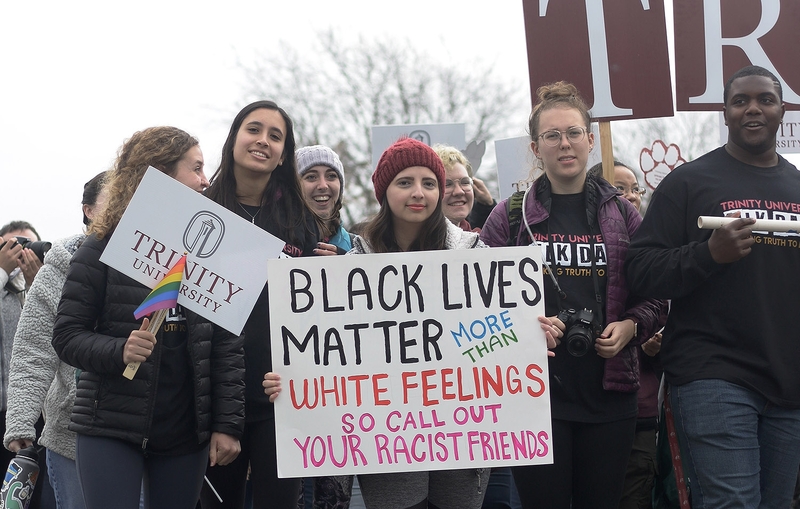 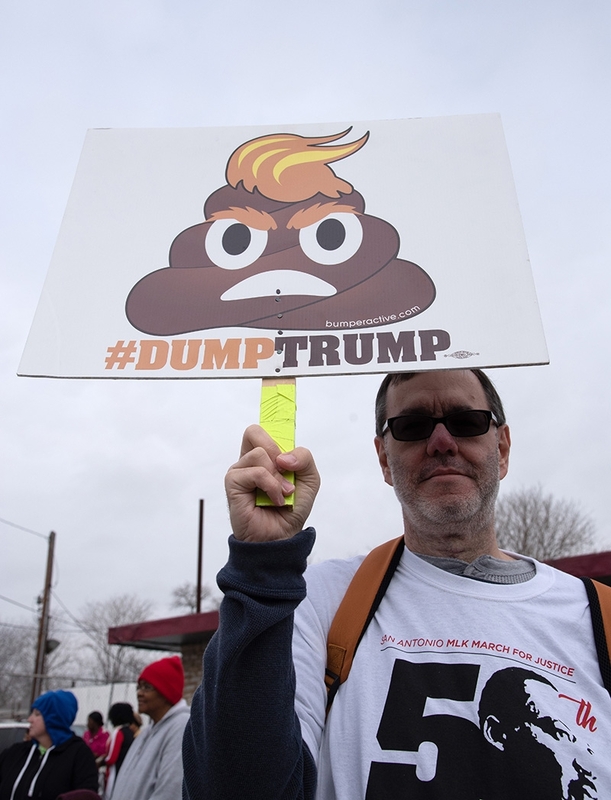 They left their signs in the air for the entire march, with the view only interrupted by people holding bags of popcorn in front of them. 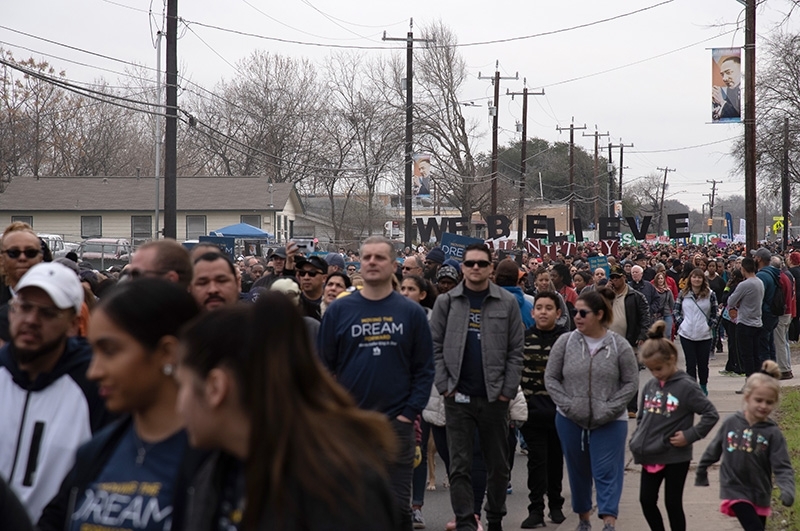 A few minutes into the march, marchers holding a banner that said “Southwest Workers Union” cut through the crowd and stopped it. 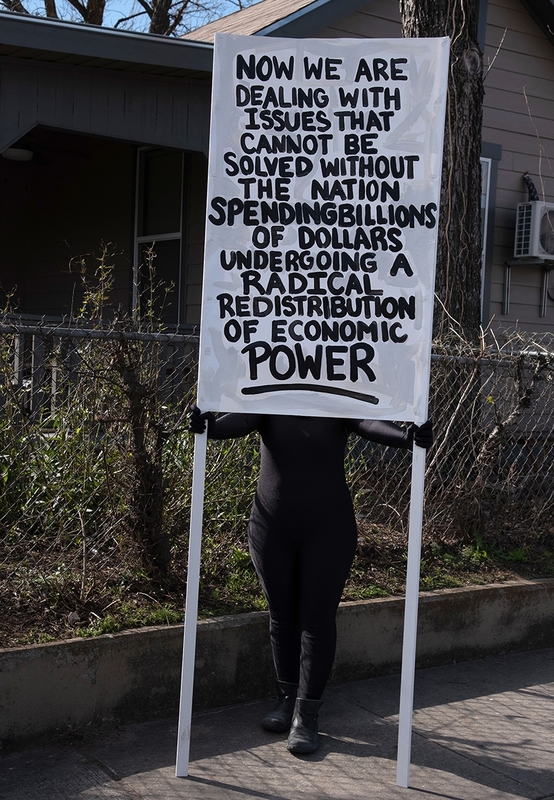 Democratic Socialists of America stops along with them, with most of the crowd maneuvering around the banner. 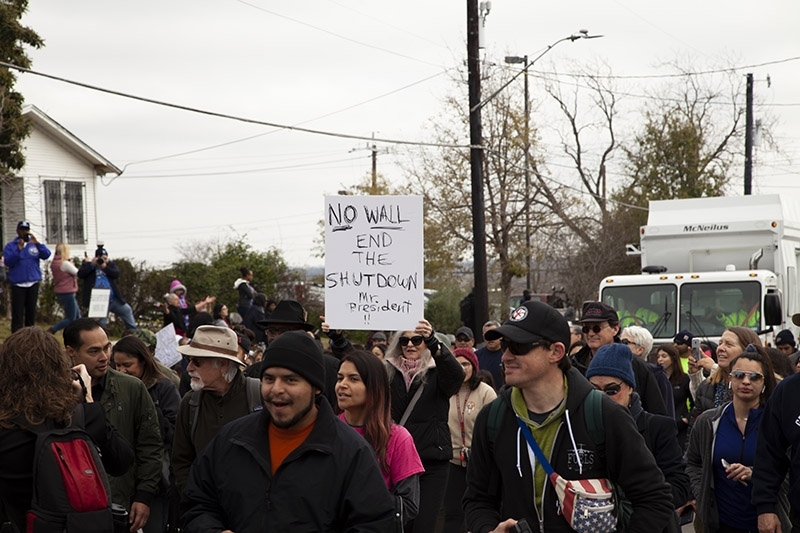 These stop-and-chants continued with other groups throughout the march, but there were too many people in front of the banners to see. 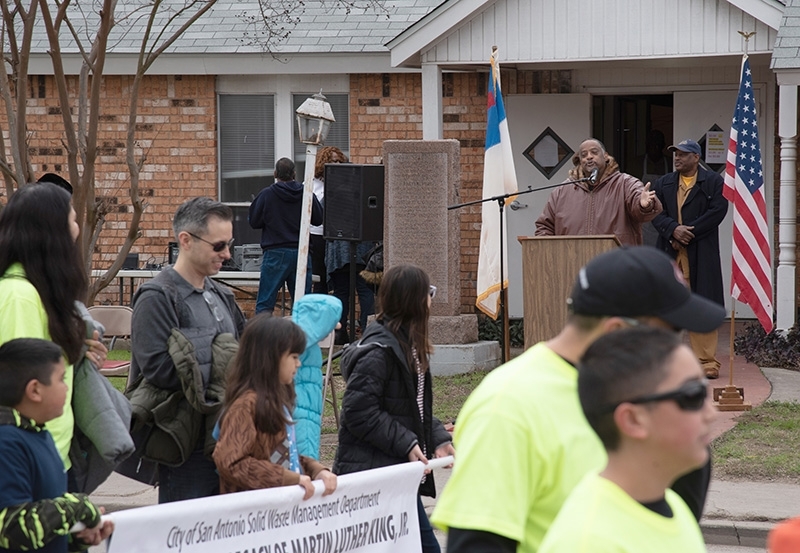 Several times throughout the march I heard people commenting on the newly renovated homes next to boarded up and condemned ones. 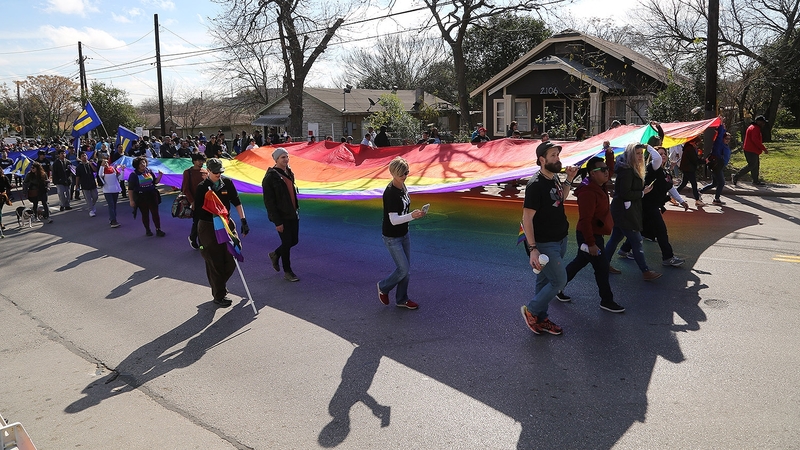 Those who’ve been attending the parade for years would point to houses, saying someone lived in them last year or two years before and now live somewhere farther north, south, east or west in the city. 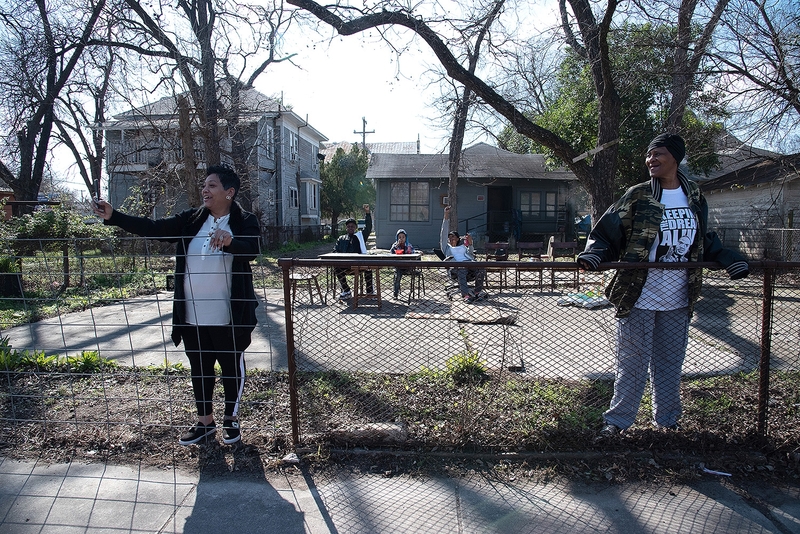 This kind of East Side neighborhood flight is evident in the marchers’ conversations, too. 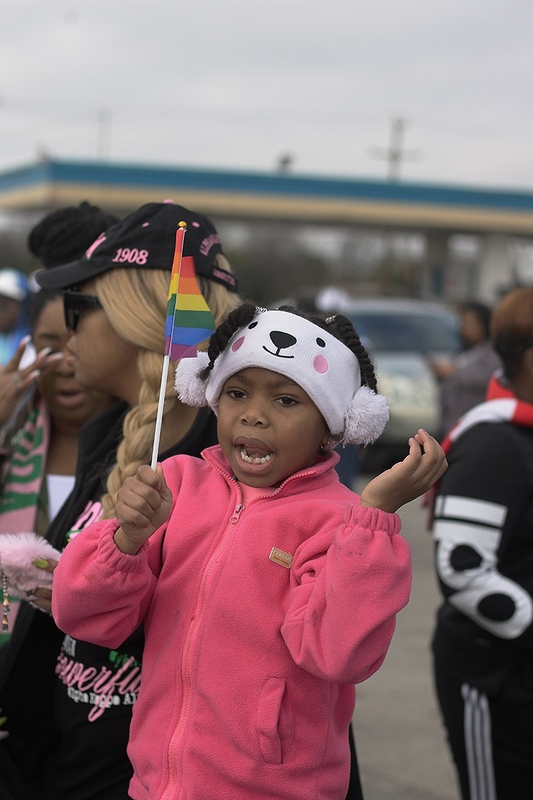 I had to squeeze past people who stopped to hug familiar faces once they found them in the parade, often, saying they missed seeing each other in the neighborhood. 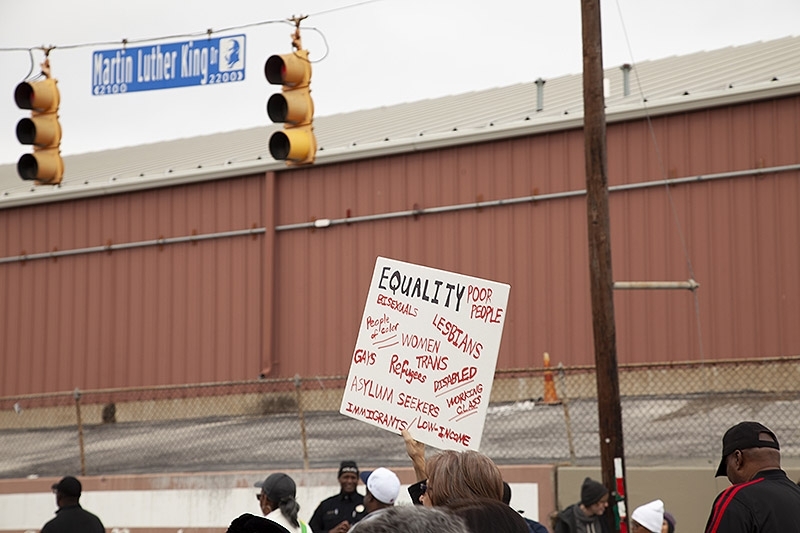 Just before the march crossed under I-10, a group of 10 GM&N Auto Tale and Auto Income employees, standing outside watching, continued a tradition started by the Rev. 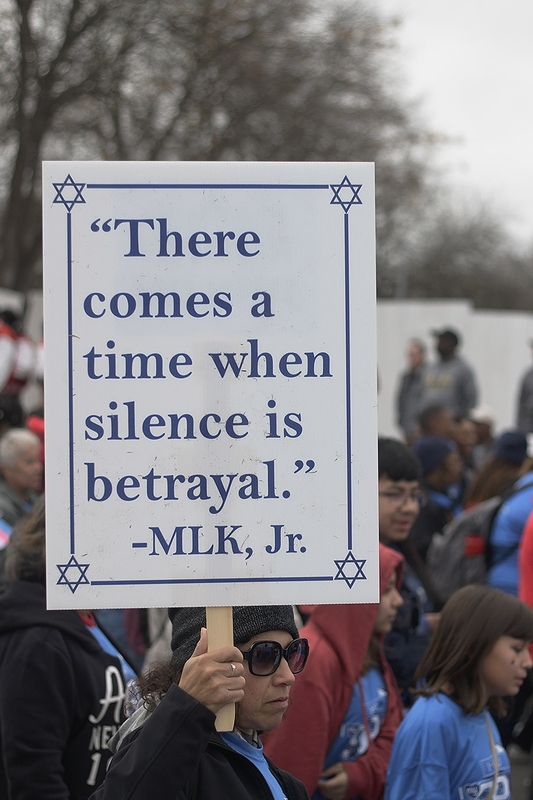 Raymond Callies in the 1980s, playing MLK speeches on a loudspeaker. 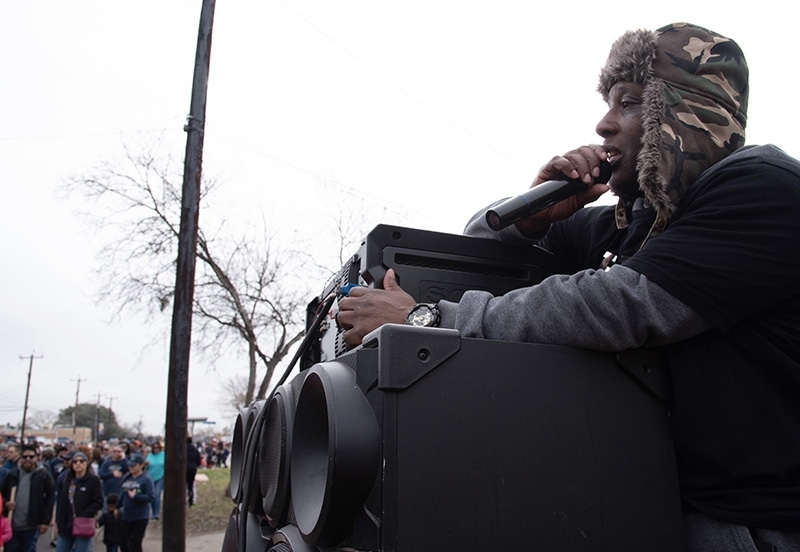 From down the street, I could see their heads bobbing. 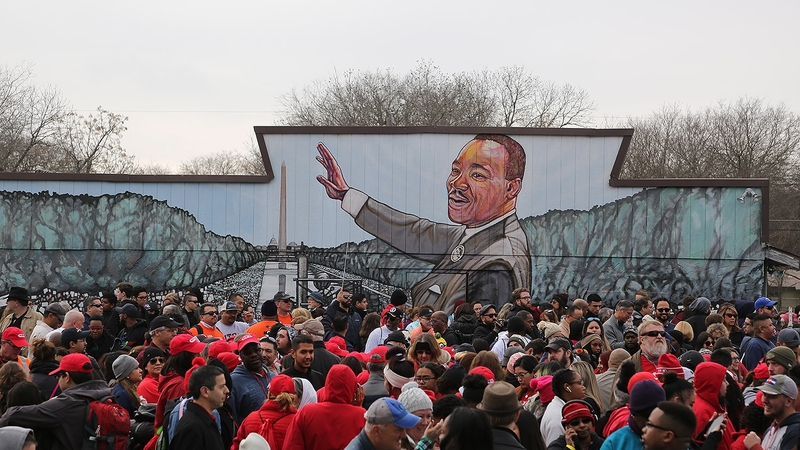 When I got closer I heard the unmistakable instrumental of Marvin Gaye’s “Inner City Blues.” MLK’s speech was being played over a song critical of inner-city ghettos and what created them, across from a strip of condemned homes, one of which, on a boarded window, “MLK” was spray painted. 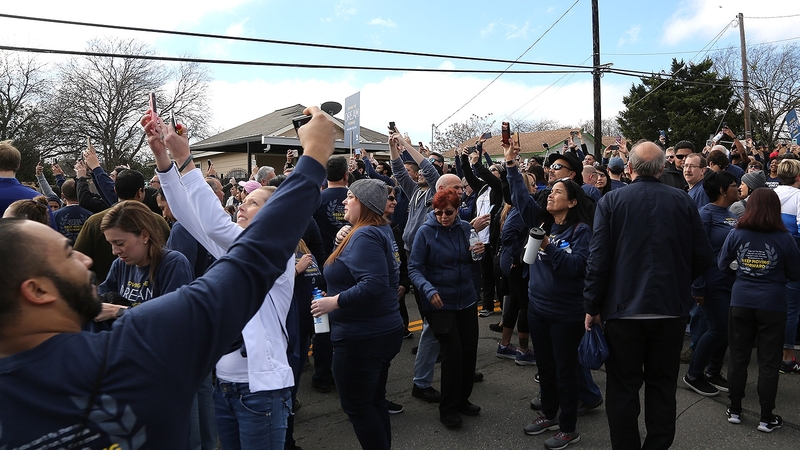 At the end of the march, I sat down in front of a house to rewrite my shorthand notes. 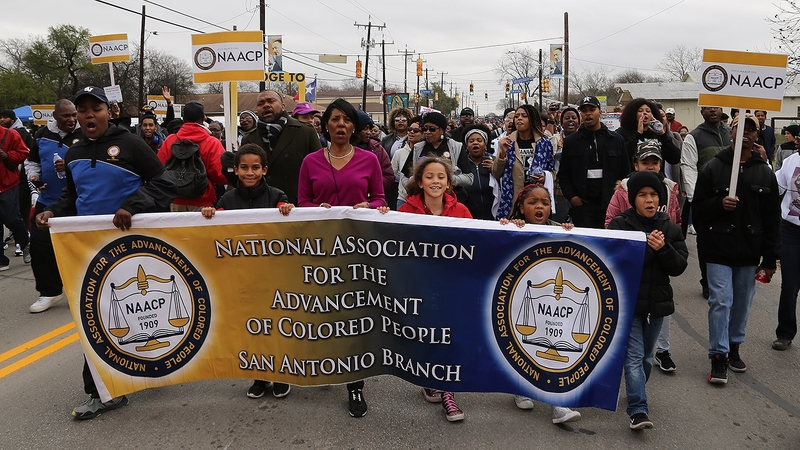 Next to me was Debra Brandon, a part-time benefits coordinator for Alamo Colleges and volunteer with the San Antonio African American Community Archive Museum. 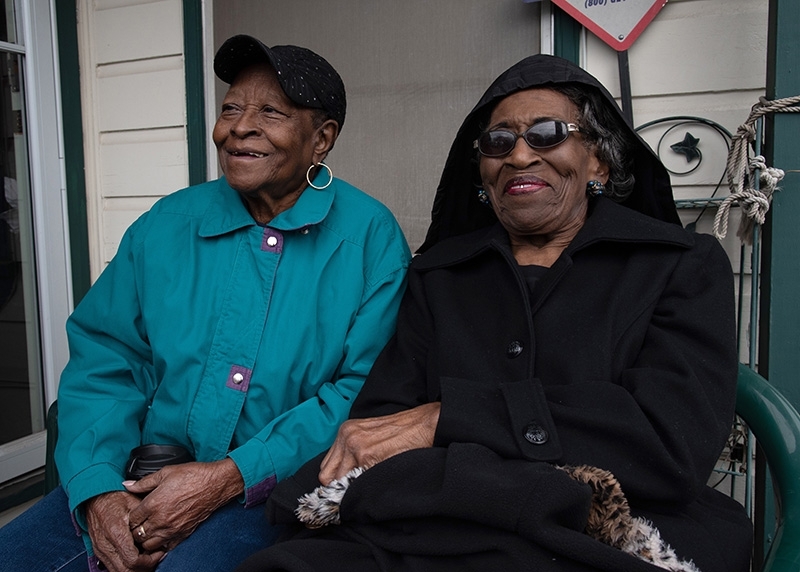 She was resting on the same stoop I was, admiring a march that she’s seen grow since Rev. 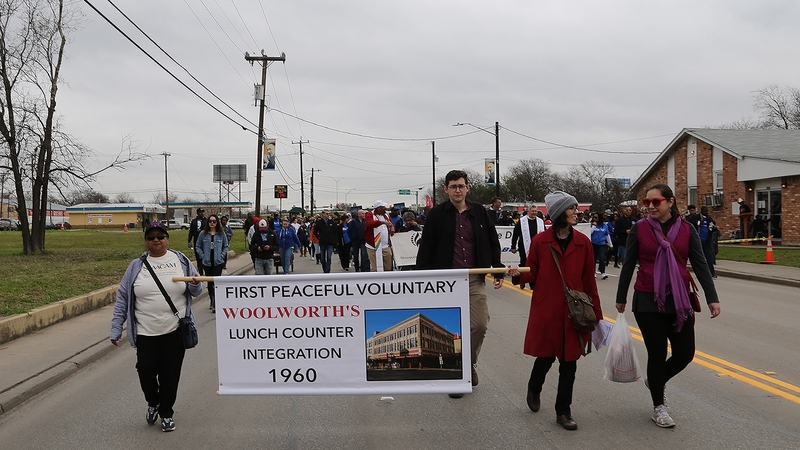 Callies, the march’s founder, participated in them some 50 years ago. 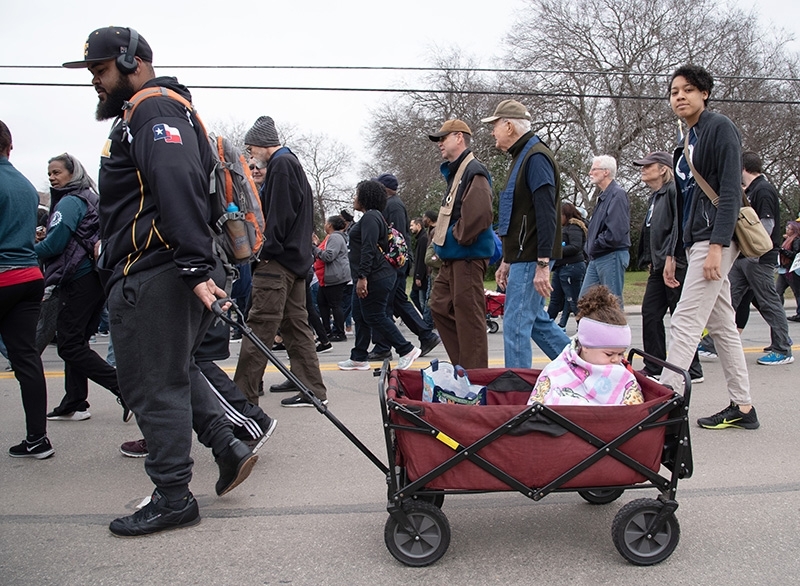 Brandon has been on the front page of the now-defunct San Antonio Light several times, because she was at the front of the march so often. 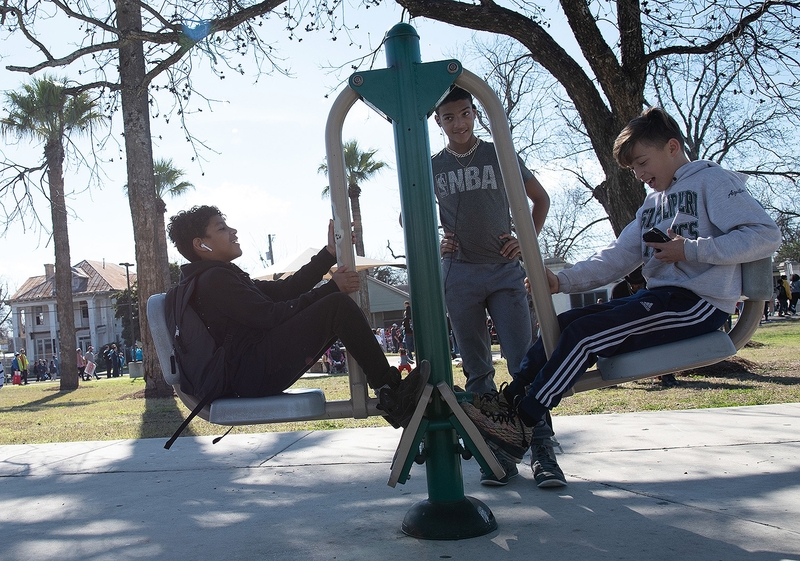 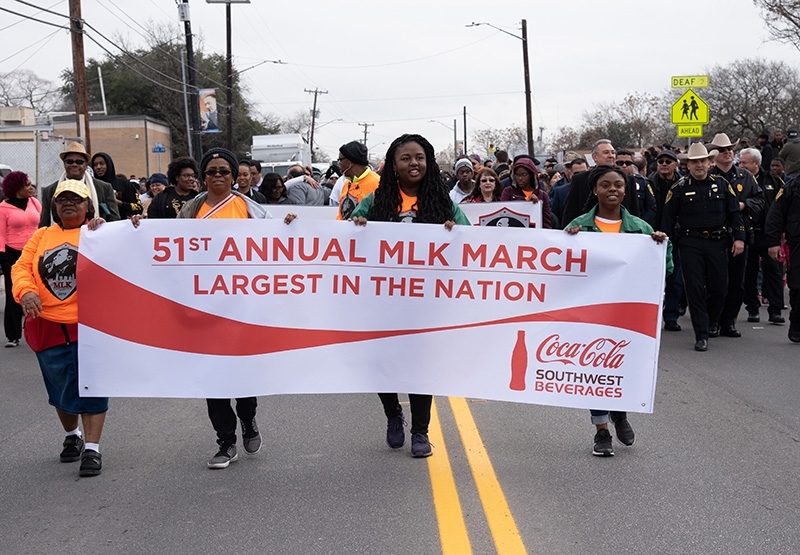 She remembers driving on the intersection of New Braunfels Avenue and East Houston Street, giving Callies change towards a statue of MLK, which was eventually erected on what is now MLK Plaza. 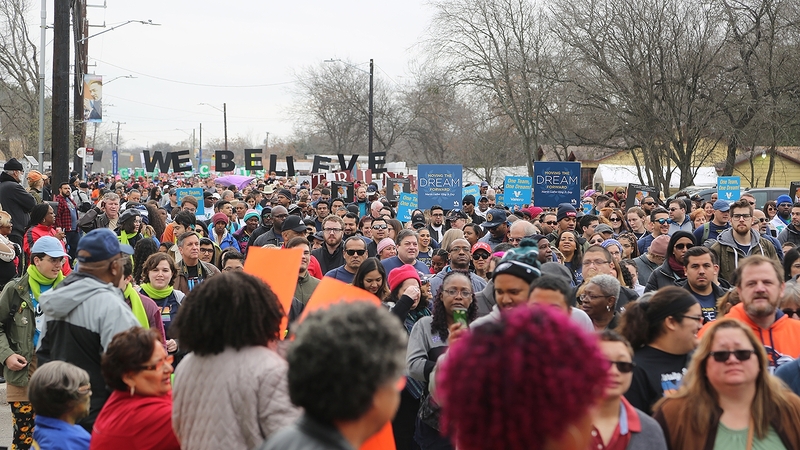 “Anybody who has died and benefitted not just black people, but all people, deserves recognition,” she said. 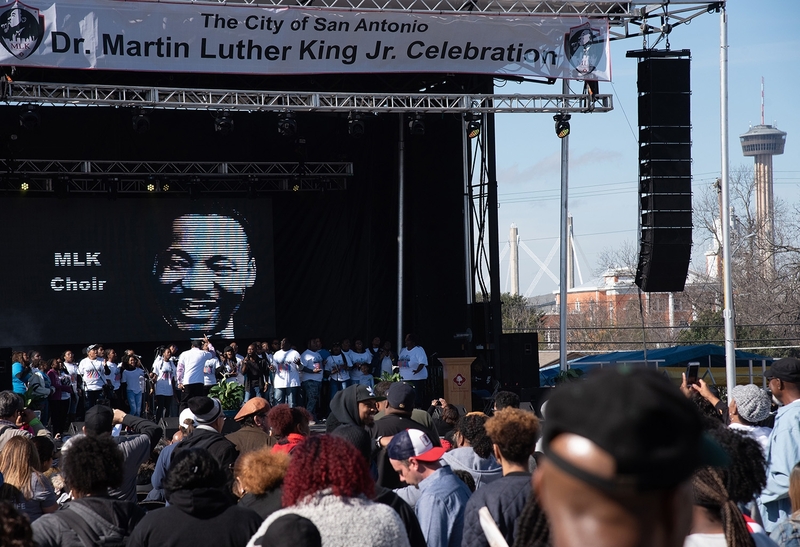 San Antonio does not, from someone not aware of its issues, seem like a city that’s more reverent to MLK than Memphis, Selma, or Birmingham. 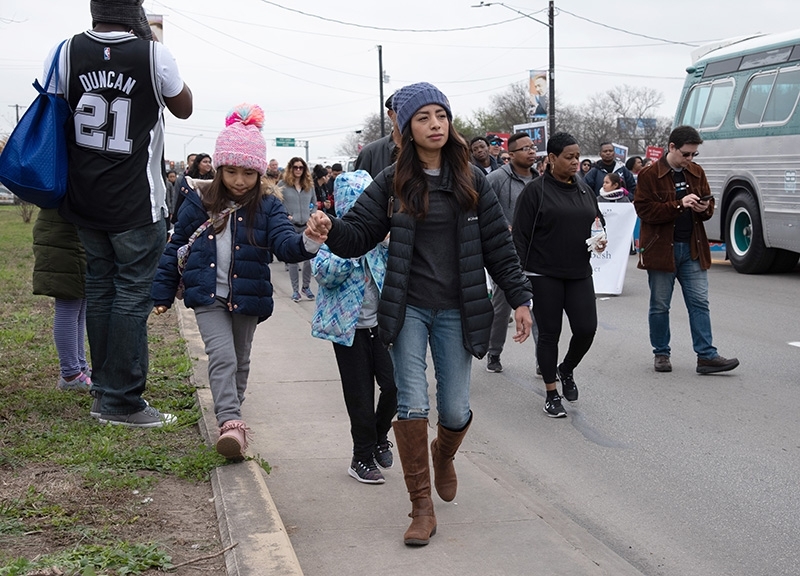 But Callies, and the churches and groups he organized with, constituting the roots of San Antonio grassroots activism, all directly contributing to the march as it is today. 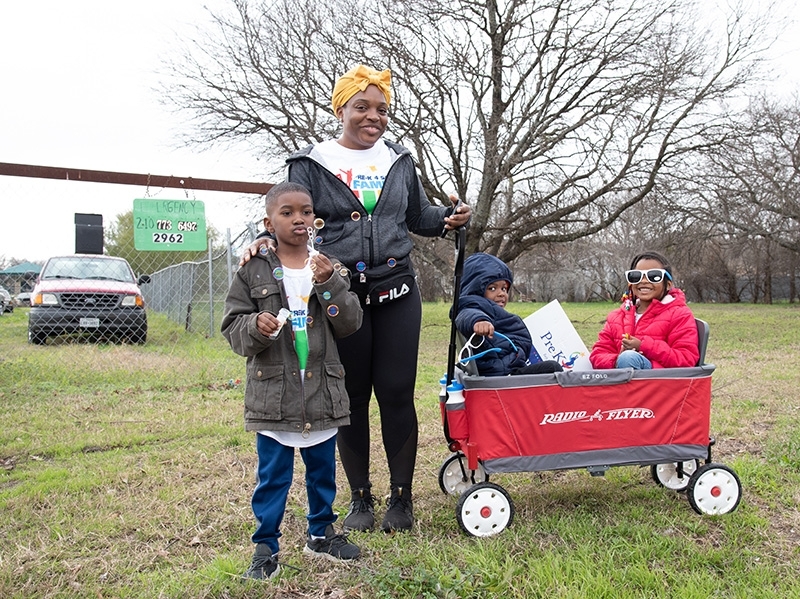 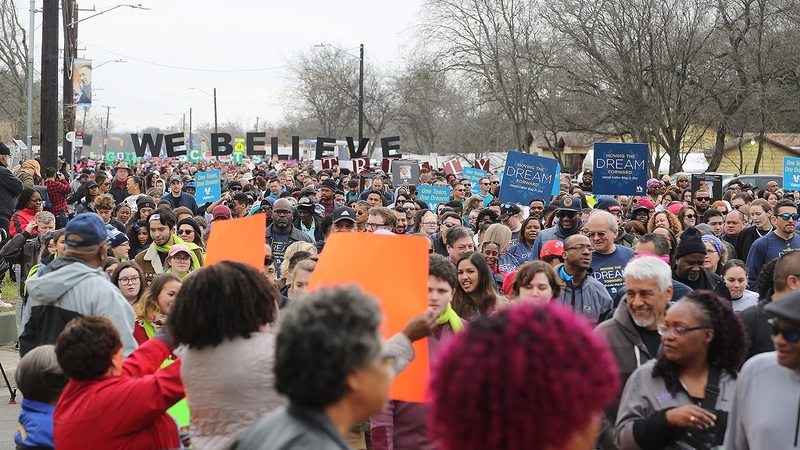 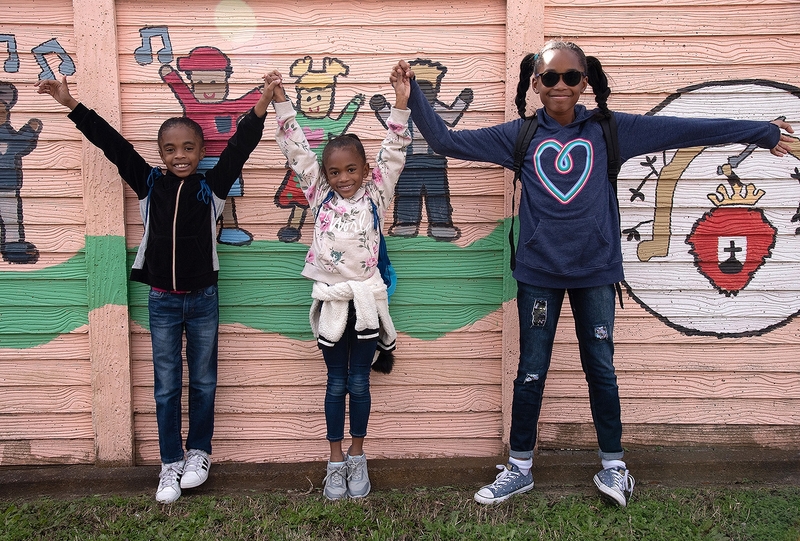 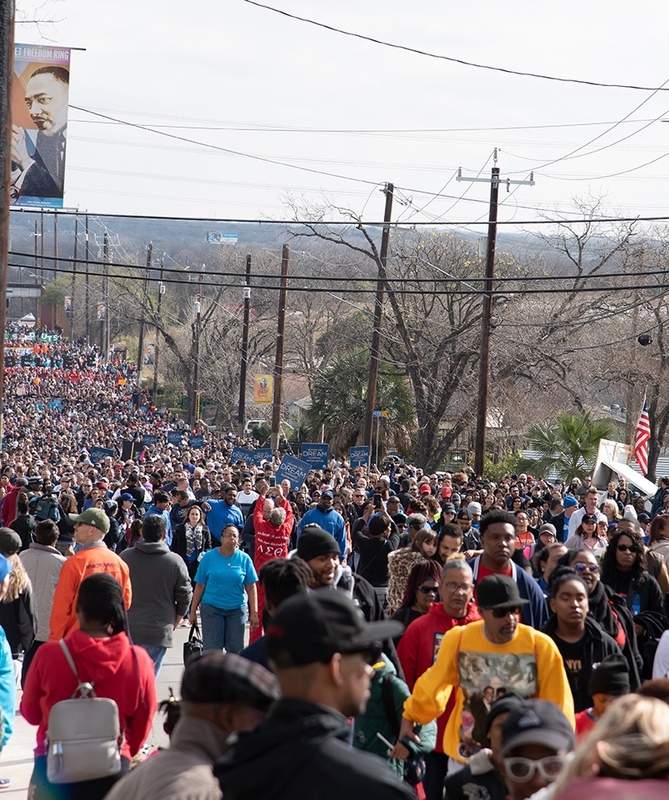 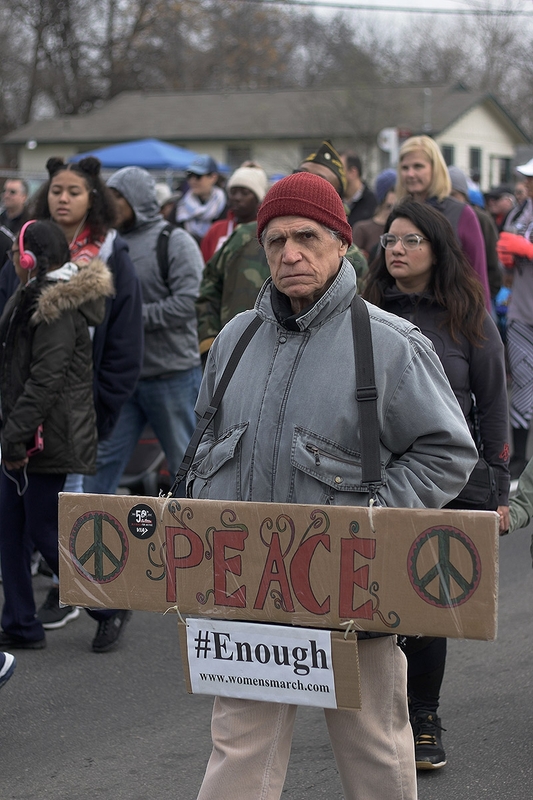 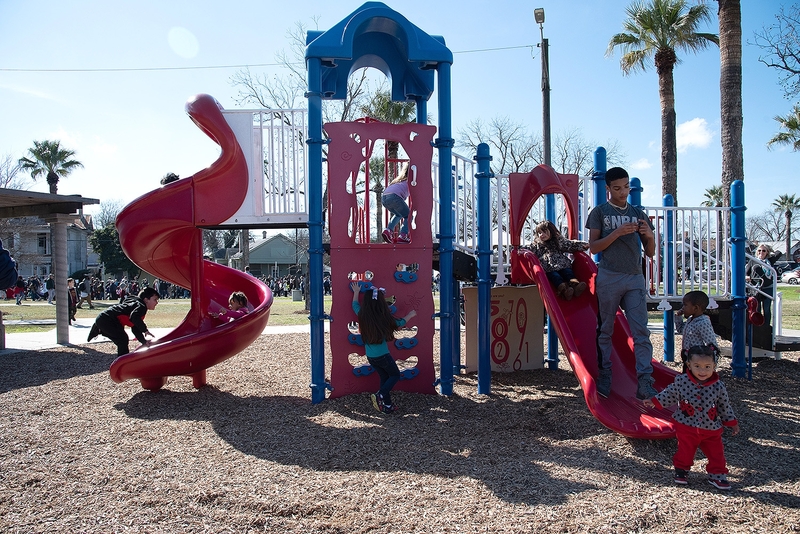 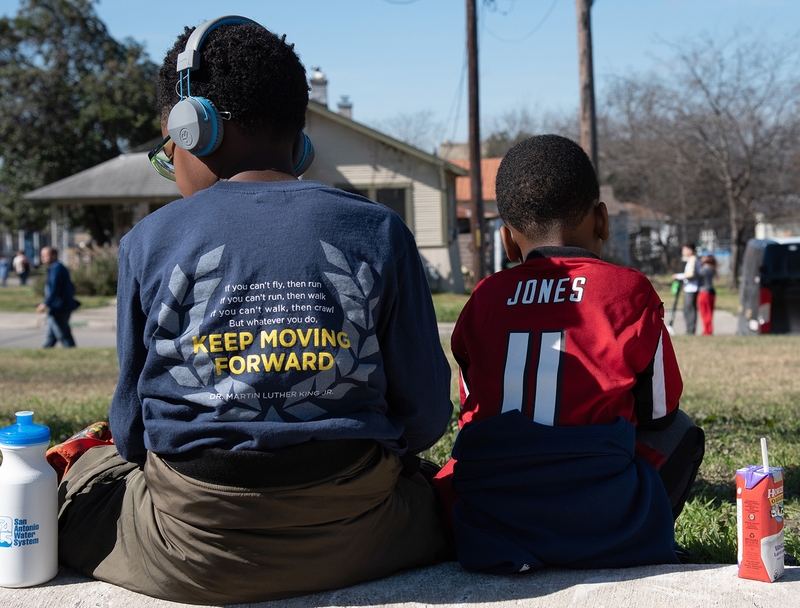 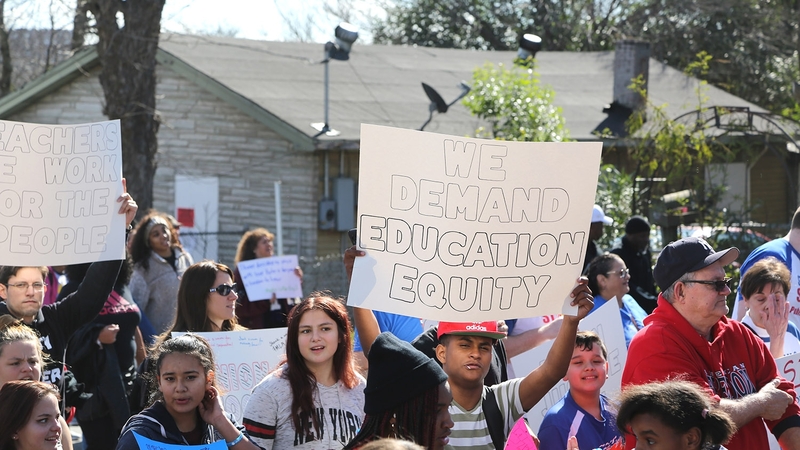 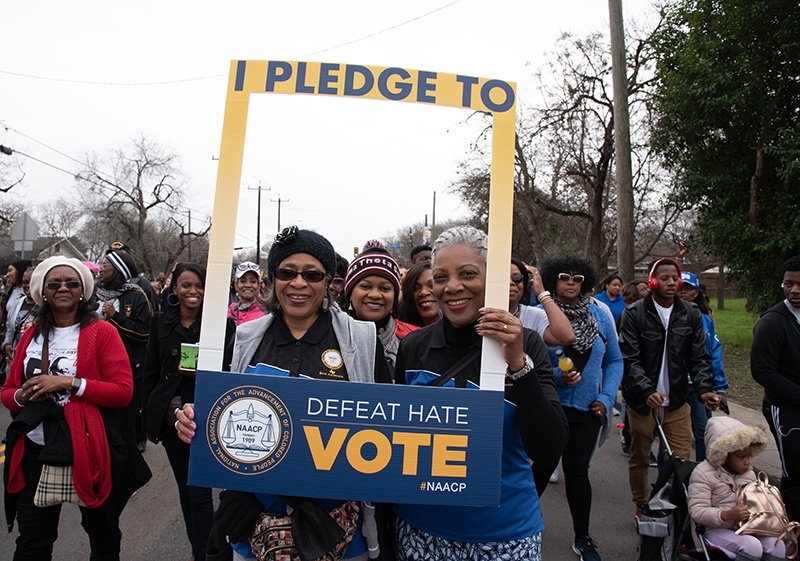 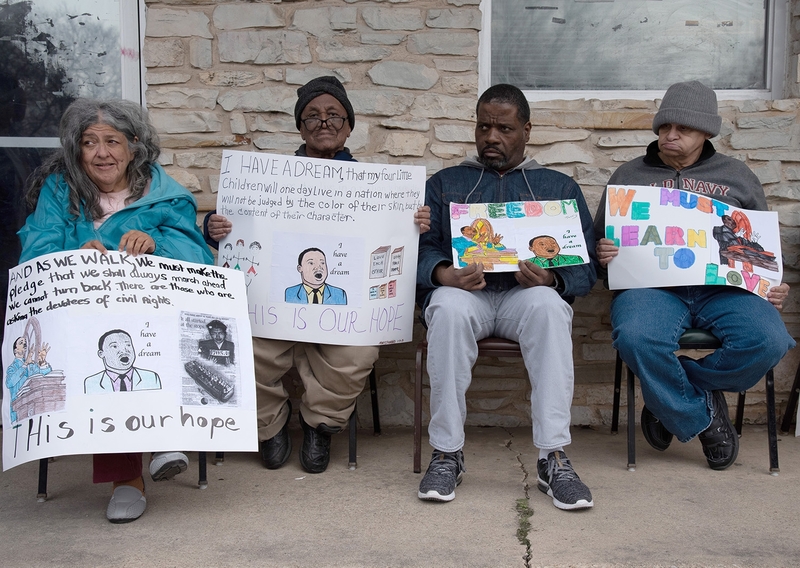 There’s no reason why San Antonio would not house the largest MLK march in the nation: it has, whether fortunate or unfortunate, always had active community organizations responding to injustice. 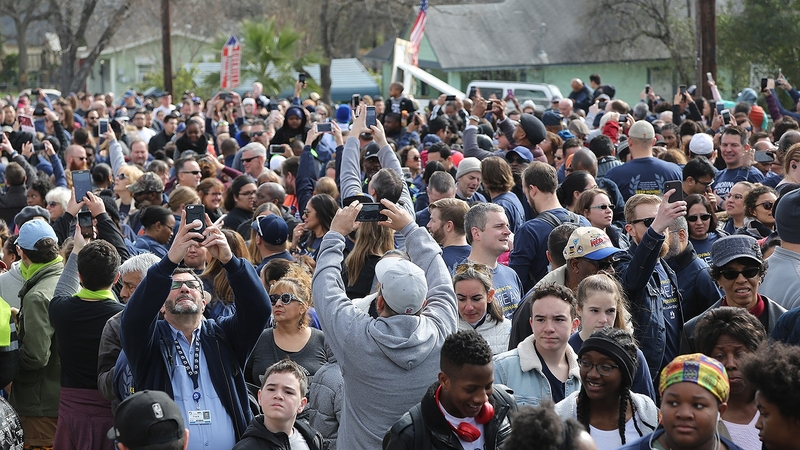 Gaige Davila, a native of South Padre Island, is a Heron reporter.